The hardest part of college often isn’t the classes or the independence; it’s what happens between your first cup of coffee in the morning and your first class: the commute. Nyeta Thomas, a student at the front desk of Georgia State’s Parking and Transportation department, said that for most people visiting the office, half request budget cards for parking at the Georgia State lots and the other half request Turner Field parking permits, but many people still use the other options such as the discounted MARTA cards. She said the Parking and Transportation office gets the most busy in the fall semester before classes start, and most of the information can be found online or on the handouts displayed at the office. For many students, commuting to school can mean walking, taking MARTA or finding parking. The Signal asked some panthers how they get to school. Greer said that because this is her last semester at Georgia State, she’s only enrolled in one class. If she was full time, Greer said she would probably “be a little more worried” about parking. “I think I’m fortunate to have a car, and the way nursing is set up, I only have to come up once a week. So I’d rather worry about gas than how to get here,” Greer said. Greer currently parks in the various Georgia State parking decks. She said that since she was coming to campus everyday, “at the time, it made sense.” Because of her class schedule being so bare this semester, Greer said she is going to look into parking at Turner Field to save some money. Taylor said that “it’s not that bad of a drive,” but traffic impacts her commute more than anything. She said she has to worry about leaving on time because it can quickly get congested, especially in the afternoons. Taylor started parking at the public parking garages around campus but now, thanks to word of mouth, saves money each day by parking at Turner Field. And while parking at public lots is $7 each day equaling to $35 a week and $140 a month, Turner Field parking is absolutely free for students. Jessica lives in the dorms because her parents wanted her to have the full college experience without worrying about a car. She gets to campus each day by walking. 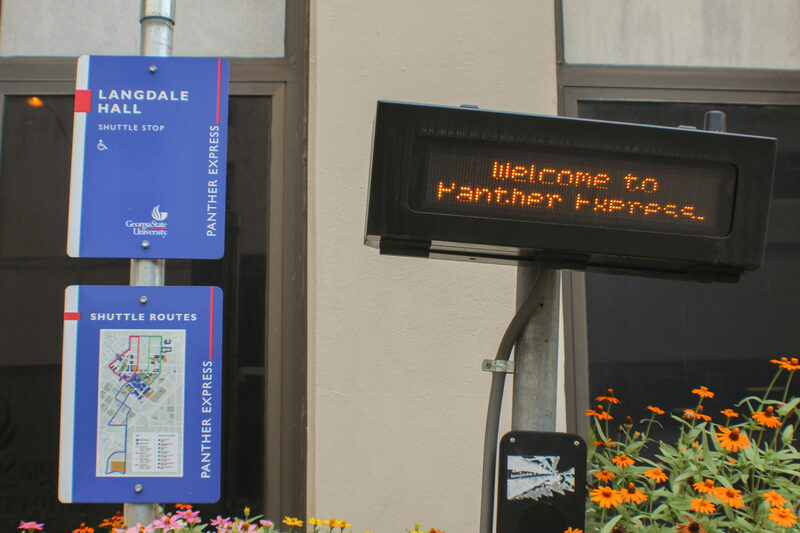 Dana Dellapi uses MARTA to avoid parking downtown and dealing with traffic. She simply walks to the station close to her apartment and takes the train to school each day. “It’s super convenient to where I live, and there are two different MARTA stations that I can get off at depending on where my classes are,” Delapi said. And because she takes MARTA, each commute takes the same time, never elongating during high-traffic times such as in the morning and in the afternoon, so Dellapi doesn’t have to worry about any surprise traffic jams barring her from getting to class on time. Dellapi said she saves a lot of money because Georgia State offers a monthly MARTA pass with unlimited rides. She is able to utilize MARTA as her main form of transportation around the city, never having to worry about hungry parking meters or mysterious men in vests booting her car.